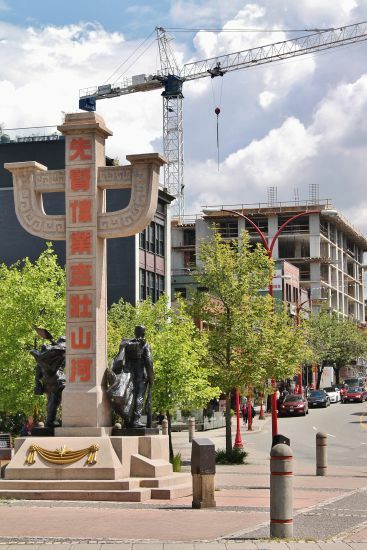 Vancouver's Chinatown is facing a dramatic influx of condos due to a change in building height restrictions set in 2011. Photo by Tyson Leonard. This is the second in a series of conversations with Vancouver-based anti-gentrification activists. These conversations will culminate in an article with an in-depth look into the effects of gentrification on Vancouver communities and the strategies being proposed to resist and ultimately stop gentrification. In the first interview, I spoke with Karen Ward about the unique community of the Downtown Eastside. In this interview, Richard Marquez speaks on the pressing need for diversity within Vancouver’s anti-gentrification movement. Richard Marquez has lived in Vancouver for the last three years and currently works as a social worker in the Downtown Eastside (DTES). He is a long time anti-gentrification warrior and a Chicano who worked with the Mission Anti-Displacement Coalition (MAC) in San Francisco. What lessons can people resisting gentrification in Vancouver draw from San Francisco’s fight against gentrification? The movement begins from below with grassroots organizing, and I think the challenge is not to corral the movement towards a mere legalistic or policy-related response or just making demands on City Hall and other governing structures. Part of it is going from neighbourhood to neighbourhood and expanding the movement city-wide, and not really grounding it in one particular area. What we discovered in San Francisco is that we became very spatially, socially and politically isolated when we only focused on the Mission district and parts of the South of Market [district]. Many of us realized a movement has to have relationships with other communities, with people of colour, low income people, even middle class renters and middle class homeowners as well. I think a diversity of relations has to be cultivated, and that’s not what I see happening here in Vancouver. I see the same cast of players, often just speaking to each other, and they are usually speaking to each other in English only. What is the best way to go about making the inroads into these communities? Are there any specific strategies for reaching out? I think it’s driven by neighbourhood based organization. It’s going to temples, churches, schools, daycare programs, places of employment; it’s on the bus, on the Skytrain, and it’s at high schools. It’s about getting out of your comfort zone and going to neighbourhoods where people are not accustomed to going. That also includes people that are low income organizers going into other areas as well, and challenging other neighbourhoods on the basis of what’s impacting them. Also, I don’t think I’ve been to any forum on housing with simultaneous translations going on, with microphones and headphone sets, in Cantonese or Mandarin or Spanish. Not one forum I’ve ever been to. Those kinds of methods have to be implemented immediately. Again, it’s getting out of your safe zone and going to places where people are not used to organizing. You’ve mentioned the need for a tenants’ action congress before. What would that look like and how would it be set up? It’s not new, certainly in terms of me putting it forward. Many generations have talked about this, from the 90’s right back to the 30’s. What I find is there is not a viable Vancouver renters’ union that, independent of political parties, non-profit societies and social service agencies, actually plays a leading role in fighting gentrification and defending tenant rights. You see slight variations of something that could begin to be that, but in the three years that I’ve been here I’ve yet to see a Vancouver tenant convention held. The city is great for workshops and forums both in the DTES and at SFU, but I don’t see a real galvanised and organized fight back that’s consistently present throughout the city. I think people are learning this is a fight we can’t fight isolated. We have to start talking to different neighbourhoods. We have to start bringing in so many different diverse political actors and start to bring in different approaches and methods to it. That is the only way we can both nurture it and sustain it. There is such a massive Asian presence in this city, both South Asian and East Asian and also people from China and other countries, as well as Native peoples. There is also more than a sliver of Afro-Caribbean and Afro-Canadian presence here. But from what I’ve seen there are very few people of colour in significant leadership positions building these movements in Vancouver. It’s inexcusable, in the 21st century, in 2014 Vancouver, in a multi-racial, multi-lingual city, it’s inexcusable that the Left knows this is happening and has not made substantial inroads to correct this. You’ve described gentrification in San Francisco as beginning with the Spanish conquest of the Ohlone people. In Vancouver, a city built on Coast Salish territory, a similar tale of colonization has and is playing out. What is the importance of tying some of the effects of gentrification and colonization together? I think that’s where we have to obviously ground our historical analysis. I mean, it’s not unusual that a huge Aboriginal off-reserve population is based in the Downtown Eastside, and minimally in other parts of Vancouver. That’s for reasons of both racial and class segregation that I see playing out here toward people of colour, particularly Aboriginal people, who are disproportionately suffering from institutional discrimination. So I think that the beginning of making those relationships is acknowledging that this is a historical fight that goes back hundreds and hundreds of years. I think the Coast Salish people understand that, and can see the relationships between the past and the present and the future in terms of the fightback to gentrification. There is an organization called the No Eviction Coalition in San Francisco and what they’ve done from the start this time is brought in culture, art, music, dance, and they’re incorporating puppetry in the streets, and murals and signs. It’s very similar to the beginnings of the [anti-]apartheid movement in South Africa, and what’s happening in Brazil right now where they are fighting the World Cup. Those are the kinds of methods that inspire, more so than speeches and proclamations. Tyson Leonard is a journalism student interested in adversarial journalism and is currently interning with the Vancouver Media Co-op. Only white people talk about gentrification? I personally feel that gentrification seems to be especially difficult to do "mass-movement" style organizing around. It's great to talk about going in to the local highschools ... sounds very positive and benign but engaging large amounts of people in a pretty complex dialogue about real estate development and afforable housing is problematic as a starting point for a conversation. Simply put, anti-gentrification should be a subset of a broader, anti-capitalist, anti-collonial movement because as a single issue, it's not a strong enough narrative. Those of us getting displaced can see it happening but it's difficult to boil it down in to soundbytes and if you don't presume other things like the class war, the discussion gets derailed pretty quickly. That's my 2 cents anyway. I like the spirit of the article by the way.